My mother had to be a strong woman to keep our family together. Dealing with everyday life in Indonesia & taking care of14 children. She comes from the village of Warungkiara and many of her uncles and her father were the Freedom fighters against the colonization, before the Independence and were of the Cimande family. In some ways you might say that Cimande theory is as simple as hit and block. A Powerful art , with most of the Indonesian men and women family of Cimande, hiding from the public what they knew. Even if you were to ask them if they knew Pencak Silat they would deny any knowledge of Cimande or Pencak Silat in general. Being humble is a big part of being in good standing with the community and being a respectful person in Pencak Silat. With no need or reason to prove what we know, because what we know is part of our daily life. If you go to Cimande, you won't find people looking and talking like they know how to fight, but rather like everyday people working together to survive and live an ordinary life. Helping one another in the village. sharing their knowledge with their family and neighbors. When we do become angry and lose control & seem to be going in the direction of breaking the rules in our society, most Cimande people have a reminder in their hearts, through their training and initiation and ceremony, not to go in the wrong direction. Because each Cimande person has to go through an important ceremony and follow 10 rules of Cimande called the Talek & Kecer mata. This is the only style has that particular ceremony and rules to follow, in West Java. And in respect of that tradition it is the responsibility of all Cimande people to remember to follow and be guided by those rules. We believe if everybody in the Cimande family follows the Talek, they will not focus and talk about somebody elses problem , flaws or mistakes or make judgements of others, rather they are quiet and busy improving and keeping themselves in the right direction. My brother and sisters continue to spread & keep alive the name of Mande Muda in Indonesia by teaching to the public in Bandung, in the Junior highs and High Schools, as well as in the College of Pasundan in West Java. Each of them practice different systems, from our parents and also from other teachers. Each individual in our family have different types of material of Pencak Silat from each other. But the characteristics of the movement sand philosophy of the arts is the same. Because of those characteristics & philosophy you can tell right away that you are seeing & learning Pencak Silat from West Java . If you go to another area like Center Java or East Java or even Sumatra, you will see that the styles from West Java are so different and that each ethinic group has their own trademarks and beliefs. And because of that we can tell from which area one comes from in Indonesia. This is something that would be difficult to judge by a picture alone. In West Java, the area where my family grew up, we speak Sundanese,but of course Bahasa Indonesia is the national language. You are more than welcome to speak in Sunda to us if you like. As that is our first language. Shannon Suwanda, she is my wife. She has been studying and has spent a great deal of time in Indonesia, training, studying and spending time with my family. She has been making so much progress in learning about the arts and the culture firsthand. 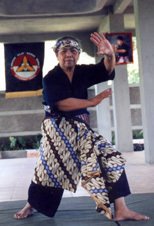 Each person has to experience for themselves the culture to understand anything about Pencak Silat from West Java. So many of my students have made the trip to Sunda, just like her, to learn and see what Penca is reall about . In West Java we perform the form we call Ibing, which is the West Javanese, or Sunda terminology for the word also known as Kembangan. In order to truly know Penca from West Java a person must learn to feel the rythm and motion in and of the form first hand with the live musicians. This is not a string of free form movements but rather there are many rules to follow & you don't have choice if you are performing Pencak Silat from West Java. if you don't follow the rule you will lose, and it would be likened to doing salsa dancing with Jazz music. Paleredan , Tepak Dua, Tepak tilu, Bombang, Padundung, Golempang, tepak hiji. Those words are classical of the Ibing from West Java and relate to the specific parts of the form alone. Once again this web is talking about Pencak Silat from West Java, I'm hoping that the traditional/classical Pencak Silat will not disappear because people want to be modern and want to be look like everybody else outside their own culture. I'm sad that in competition, starting this year, there will be no more traditional Ibing, no more Music (Gendang Pencak) in the Pencak Silat Nasional, instead new Pencak Silat has just arrived., New Jurus and New Ibing (Kembangan) born from a belief in uniting the art. No more individual characteristics from particular areas, as was once readily apparent. I will keep the tradition in Mande Muda. I will continue spreading the art in that way to the world so the traditional Pencak Silat will remain for many generations to come. In hopes that the new generation of Indonesians will also keep the tradition of our blood and our family as Sunda people. 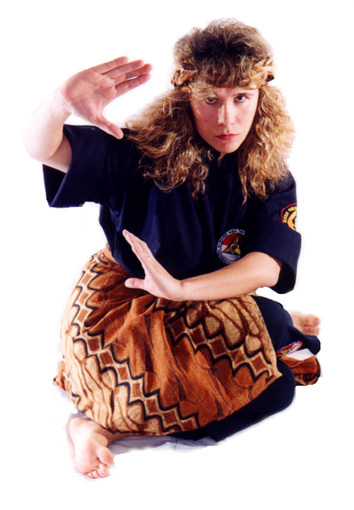 Without trademark characteristics in Pencak Silat, we have lost our identity. I am so happy many Westerners are learning the traditional art and not just wanting to learn to break necks or trying to nail each other with words and action but rather, learning on a deeper level than that. By learning Ibing (kembangan) the culture won't disappear. I just want to say thank you to all my students around the world who are helping me to protect the arts and continue their traditional aspects, characteristics and philosophy.